M27 (NGC 6853), The Dumbbell nebula. 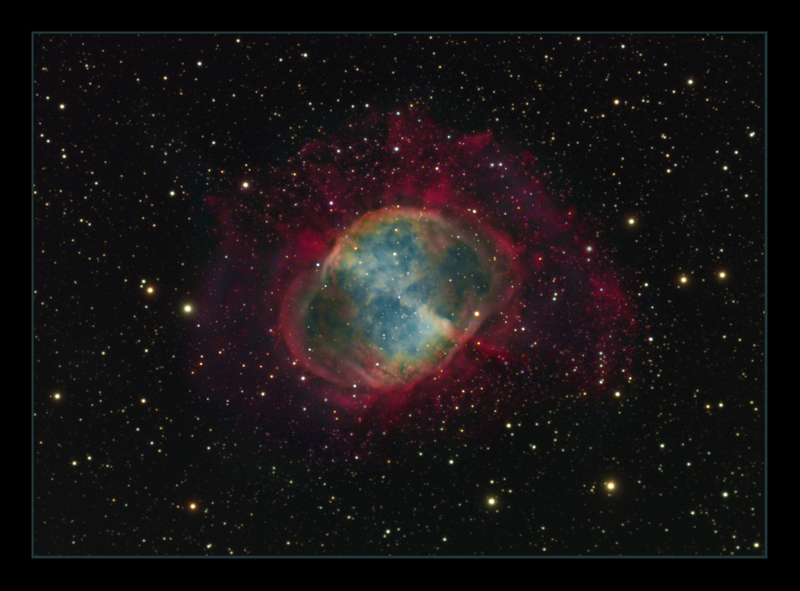 This was the first planetary nebula to be discovered, by Charles Messier, on the 12th July1764, and was first compared to a dumbbell by John Hershel. from the pole it is thought to look like a ring, similar to the famous 'ring nebula', M57. It is bright enough to be seen in binoculars, having a magnitude of 7.5 and a diameter of 8 arcminutes. Central white dwarf ( magnitude 13.5) is believed to be larger than any other white dwarf known, with a diameter of approximately 48000 miles. It is very hot, with a surface temperature of about 85,000K. It lies in the constellation of Vulpecula, and is at a distance of 1,250 light years, so we are seeing it as it was just before the Vikings invasions started in earnest in Great Britain. This is a false colour image, comprising of a blend of red and Ha for the red channel, green, Ha and OIII for green, and Blue and OIII for the blue channel. The combination of Ha and OIII with the green is something that I find works very effectively in this object. The extended outer halo was something that was very hard to capture from my light polluted home site, and even with NB filters, was only barely above the background sky glow. In order to bring it out, I ended up shooting a whole night each of OIII, binned 2x2 to increase sensitivity, and Ha binned 1 x 1, just for the halo. No luminance layer was used. TMB 152@ F8. Atik 16HR. Red-10 x 10 minutes. Green-10 x 10 minutes. Blue-18 x 10 minutes. Ha-26 x 15 minutes. OIII-9 x 10 minutes binned 1x1, 13 x 15 minutes binned 2x2. Total imaging time. 17hrs 35 minutes. Imaged on the 17th, 19th & 23rd June, and 4th, 10th & 23rd August 2010.